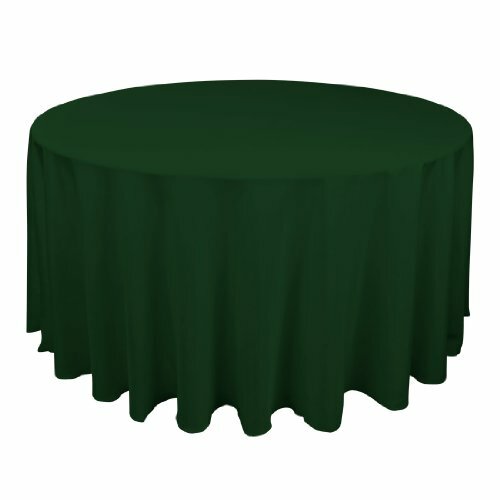 Our round tablecloths feature serged edges to give a finished look of elegance. These durable, machine-washable tablecloths are made of a heavier fabric than most other tablecloths on the market, and we are confident that these quality tablecloths may be used and washed many times before showing signs of wear. Our round table linens are available in a beautiful array of rich colors, designed to complement nearly any color scheme. These tablecloths are seamless (made from a single piece of cloth) and are made of 100% woven polyester (Dacron). This tablecloth is made of woven polyester - durable, wrinkle and stain resistant, and can be used a hundred times or more. Since varying table diameters and widths will give different tablecloth drop lengths, please refer to our sizing chart to determine the correct tablecloth drop for your needs.